Every spring, the Sedona Chamber of Commerce & Tourism Bureau is pleased to release and distribute three publications: The Sedona Hometown Guide, The Experience Sedona Guide, and the Sedona Destination Event Planner. All three publications are printed on certified Sustainable Forestry Initiative paper. The 2019-2020 Sedona Hometown Guide (HTG) is the best resource for residents to live, work and play in our beautiful home. The HTG is used as a relocation guide and sent to new residents. All SCC&TB partners are featured in the HTG as well as local events, ideas to stay healthy and active, tax charts, weather, maps and much more. We print 10,000 HTGs and distribute to local businesses, at the Official Visitor Center in Uptown and through the Red Rock News. 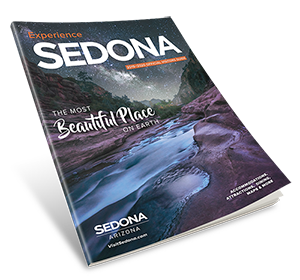 The Experience Sedona Guide (ESG) is a vibrant magazine produced to assist Sedona’s 3 million visitors. It includes information about art, culture, accommodations, dining, shopping, recreation, adventure, attractions, daytrips from Sedona, history, plus listings of the Sedona Chamber of Commerce & Tourism Bureau’s (SCC&TB) tourism related partners. We print 275,000 ESGs and we distribute them at our Visitor Center as well as hundreds of locations across the state including the Sky Harbor Airport in Phoenix. The ESG is also available at AAA offices nationally. As an expansion to our wellness pillar, and new to the ESG, is a wellness glossary full of spiritual and metaphysical definitions. There is also wellness grid where the reader can easily identify which practitioner to see based on a myriad of defined services. The ESG seeks to educate potential visitors about the best times to visit (summer and winter, midweek), and teaches visitors in market about the roundabouts, sustainability efforts, off the beaten path locations, leave no trace methods, walkability, and respect for the land, residents, neighborhoods and local culture. The ESG and the Destination Event Planner (DEP) are used by the SCC&TB when we are working with tour operators, travel agents, meeting and event planners, travel writers or film professionals. The DEP aims to “blur the line between vacation and board meeting” by providing meeting services, accommodations, dining and much more. We print 2,500 annually. If you have any questions about any of the three guides, would like to pick some up for your family and friends coming into town, or utilize these free guides for your business, go to our Official Visitor Center in Uptown Sedona on 331 Forest Road. To view the guides online via turn-page technology, visit SedonaChamber.com/guide-books.